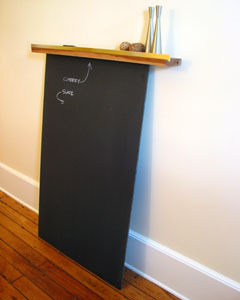 This simple piece was made to utilize a sheet of chalkboard slate that was salvaged during a demolition project. The shelf consists of a plank of cherry with two slots cut into it. An angled slot cut on the bottom side is wide enought to slip snugly over the end of the slate. A vertical slot cut into the top accommodate the aluminum bar that forms a lip on the shelf's edge. The whole thing leans againt the wall and, since the bottom slot is angled, the shelf remains level and provides a home for keys and cell phones. The slate is used for notes and lists.